So much can be said in a name. From first impressions to deeper analyses, a name holds a lot of weight. Understanding this, the legendary Chris Cornell has re-released his debut solo album, ‘Euphoria Morning’, under the more allusive title, ‘Euphoria Mourning’, reissued through CD, digitally and on vinyl. Upon the impending release of his latest album, ‘Higher Truth’, Cornell’s re-release and name change of his classic debut brings new connotations to much loved tracks, with the simple addition of just one letter. Straight away we’re pulled in with a steady groove from ‘Can’t Change Me’. A breezy melody and alluring guitars paired with Cornell’s illustrious vocal range create a bewitching sound. Nods to the psychedelic sounds of the sixties can be heard in ‘Flutter Girl’ with an upbeat pop intro leading to a unique combination of sounds and influences that compliment Cornell’s powerful, gritty vocals. Drawing more sixties inspired influence is ‘Wave Goodbye’ which matches syncopated rhythms with light, airy vocals, displaying an impressive range. A noticeable presence of gentle acoustic guitar is heard in the whimsical ‘Preaching the End of the World’ and ‘Sweet Euphoria’ while country influences tackle the surface of ‘Disappearing One’. A great amalgamation of genres continues through the soulful and bluesy ‘When I’m Down’. The country influence in tracks such as ‘Moonchild’ work with a clear rock formula to create a labyrinthine sound of twists and turns through enchanting instrumentals. ‘Follow My Way’ carries on the rock influence while building on itself to create a rich, textured sound. The inevitable glaring influence of Soundgarden is heard throughout, while Cornell’s other solo work expertly weaves the formative sound into the fabric of the album. 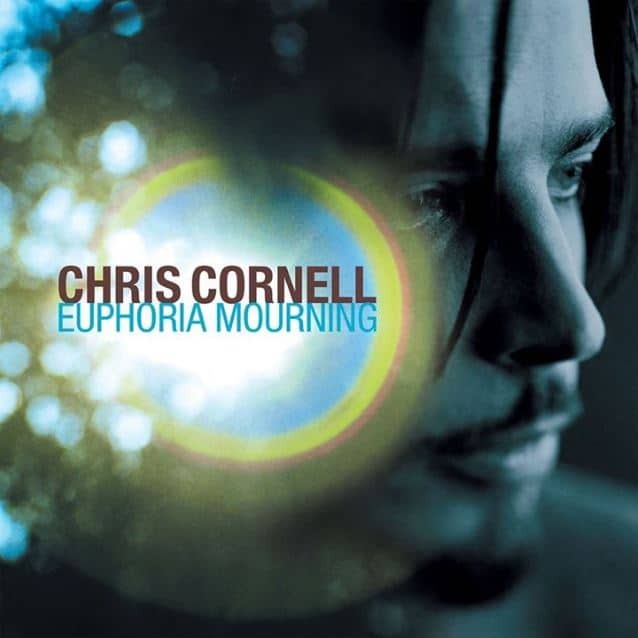 Nonetheless, Euphoria Mourning is a great chance to hear the evolution of Cornell as an artist upon re-listening and bring the nostalgia flooding back. The standout track for us has to be ‘Steel Rain’, bringing the perfect conclusion to the album with Cornell’s harrowing vocals and a multi-faceted instrumental breakdown that creates a solid dynamic. Re-releases are usually good for producing a high-quality version of our nearest and dearest albums while sometimes throwing in the odd bonus track to excite the fans. ‘Euphoria Mourning’ reinvigorates a classic sound and presents Cornell’s journey as a solo artist in a new light sixteen years later, leaving us eager for Cornell’s next chapter.